Starting this week, you can access the Email Newsletter Report Card, a free tool to help you grade your email marketing campaigns from 2012. The tool uses data from 300M+ email-sends. It generates an infographic to show you how your newsletter compares with others and provides insights on how to improve in 2013. You’ll receive a grade in multiple areas, including open rate, click-through-rate, list growth, unsubscribe rate, and spam complaint rate. To generate an infographic, you can log into the Report Card tool with any major email service provider account. The Report Card then analyzes your data and sends you an infographic, showing how different aspects of your newsletter performed in 2012. Your open rate is the ratio of the number of subscribers who open an email campaign to the total number of subscribers. 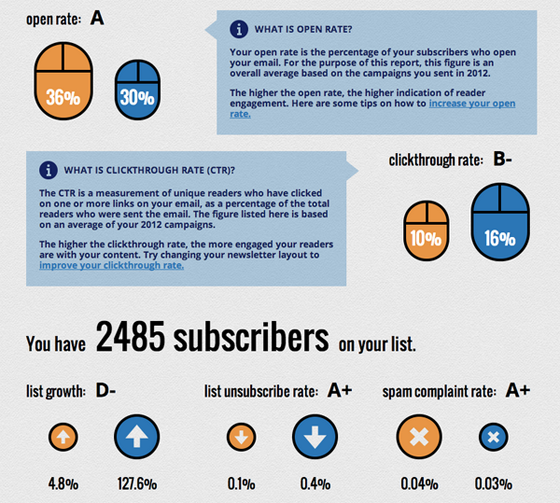 Your infographic averages open rates across all campaigns for 2012. This average open rate is a very good indicator of your audience’s interest in your messages. Although it’s nearly impossible to get a 100% open rate for large lists; A-lists generate over a 30% open rate. If you are not getting an A in this category, you should really focus on improving this metric first. Whittle your list: Most marketers hate to remove subscribers, but frankly, if there are people on your list who have not opened any of your emails in the last 6 months, you should remove them or email them less frequently. Emailing them on your current schedule is simply a waste. Try sending at different times: Most marketers schedule their messages to go out on the hour. Why not try emailing people at the :27 or at another random time? 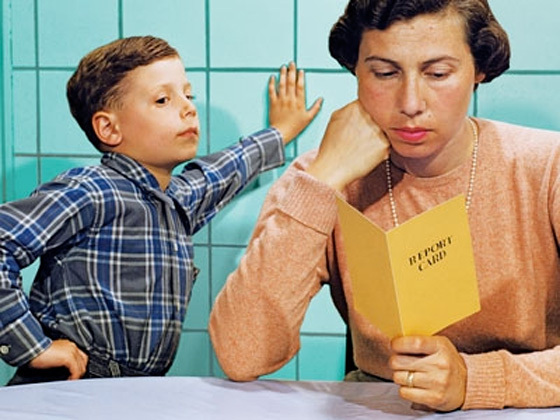 There are a number of blog posts that suggest certain days and times are better for sending. However, the best way to really understand the optimal send-time for your list is to experiment with different send-times yourself. Split test subject lines: This piece of advice is the most common amongst marketers, but unfortunately, it’s the least effective for companies whose email lists are too small to split test with. Moreover, the lessons and gains you get from split testing one email campaign do not carryover to the next. That said, if you do have a big enough list (e.g. 100k+), it may be worthwhile trying to test different subject lines. Common ways to test include reducing the number of characters, using special characters, and changing your diction in your subject line. Click-through-rate is the ratio of clicks on a given campaign to total number of subscribers. In the above infographic, you can see that the click-through-rate of this list needs major improvement. Reduce the number of links in your email marketing to 5 or less: If you are looking to drive more clicks to a specific call-to-action, having less than 5 links statistically-speaking funnels more clicks to positions #1 and #2. Place your call to action in one of these positions. Change your layout to a single column: 1) There are certainly newsletters with multiple columns that have high click-through-rates. But, a single column increases readability of your newsletter and potentially your click-through-rate on a specific call-to-action. 2) If a large percentage of your readership opens your emails on mobile, having a single column layout is more mobile-readable, making the layout more conducive to mobile clicks. Use links or CSS buttons: Not all email subscribers turn on images in your email newsletter. Make it easy for your readers to view and click on content even if their images are turned off. Use CSS buttons or links instead of graphical buttons so that your call-to-action can be seen by all your readers. Your list growth is computed as the percentage of growth from the beginning of the year to year end. Your list growth is directly influenced by the amount of subscription opportunities you have on your blog/site. A growing list can lead to more revenue opportunities, and hence it’s something you should work on making as relevant to your business goals as possible, so that your subscribers are inherently predisposed to potentially becoming a customer in the future. Your unsubscribe rate is the ratio of the number of people who unsubscribe to the number of emails sent in a given campaign. The infographic presents the average of all these numbers. This stat is a good indicator for how many are no longer interested in your content. High unsubscribe rates are largely due to at least one of three reasons. Your spam complaint rate is the ratio of the number of spam complaints to the number of emails sent in a given campaign. The infographic presents the average across all email campaigns in 2012. This stat is really important to watch. High spam complaints are generally caused by the same reasons as the unsubscribe rate. However, with spam complaints, it is more likely there are issues with how you obtained your list in the first place. If you bought/scraped/found email addresses and added them to your list, you should remove those immediately. Some of those email addresses you obtained may be spam traps and may end up causing all of your emails, even the legitimate subscribers, to go to spam filters. However, there are also certain channels of subscriber acquisition that lead to higher spam complains. For example, people who subscribe via social media tend to press the spam button more than subscribers who came from other email newsletters, even though they legitimately opt into your list. Be aware of the marketing channels that lead to higher spam complaints. If you are having a spam problem, you should aggressively clean your list, and follow the tips mentioned above in the open-rate section regarding whittling your list. If you are using an email service provider and are on one of their shared IP addresses, it is especially important to keep your spam complaint levels low. Email service providers typically send emails for their customers from multiple IP addresses. They place their “best” customers on the cleanest IP addresses and their “spammiest” customers on their dirtiest IP addresses. This means that if your email service provider deems you as “spammy,” you will share IP addresses with other spam publishers. So, even if you are able to reduce your spam complaints, the spam complaints caused by other newsletters sharing your IP address can cause your emails to go to spam! This is a terrible downward cycle, which is why it is important to stop spam complaints immediately. The Email Newsletter Repord Card also provides other interesting stats, including but not limited to how many links, words, and images used on average compared to other email marketing campaigns. To see all of your stats, get your free Email Newsletter Report Card to learn more about how you can improve your email marketing in 2013. Elizabeth Yin is the CEO and co-founder of LaunchBit and Newsletter Directory, an ad network for high quality email newsletters.